I'm sticking to a single review of this one instead of a two part review. The book is funny and about cleaning. I don't have much differentiation in those two categories for writing and entertainment value. I actually enjoyed a book about cleaning things, so in my opinion the book succeeded in both categories equally. I really liked Kerr's sense of humor. I think she takes something that is a bit of a boring subject (no offense to those of you who like to read cleaning descriptions - if you exist, comment and let me know) and makes it delightful to read. Obviously it's informative too, and I thought she covered cleaning disasters that I might actually encounter. Confession: I don't spend my weekends cleaning my blinds or dusting the top of my fridge. But I HAVE had a giant bottle of sticky juice spill all over my kitchen and no idea how to clean it up. This book solves that problem in a lighthearted way. 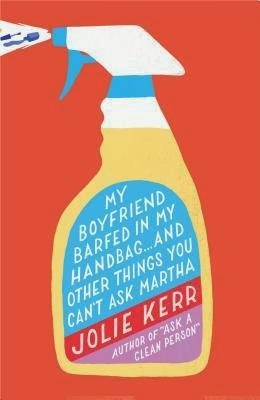 The author also addresses other, rather intimate cleaning situations that no one ever teaches, so props to her for going there. I learned things. Basically, I'm going to need to pick up a copy of this one to keep on my shelf for reference, but you can also sit down and read through it enjoyably. I definitely recommend it. Thanks to NetGalley for providing me with a copy.